I love seeing the rare coins at the Smithsonian Museum in Washington, D.C.
What Rare Coins Are On Display At The Smithsonian Museum? The Smithsonian Museum has more than 1.6 million old, rare, and valuable coins in its National Numismatic Collection. Not all of these coins are on display. In fact, only a tiny fraction of the entire Smithsonian coin collection is actually on display for the public to see. As a longtime coin collector, I was overwhelmed by the number of legendary rare coins that were within inches of me as I walked through the Value of Money and Stories on Money coin exhibits at the Smithsonian. The Stories on Coins and Value of Money exhibits are both located in the Smithsonian’s National Museum of American History. 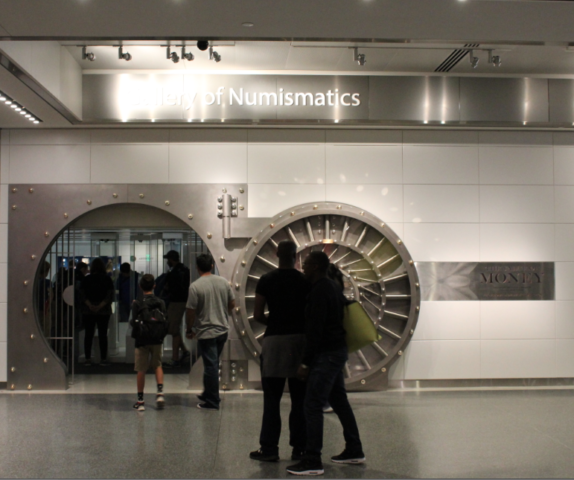 When you walk into the museum from the National Mall side, you’ll proceed down the to the first floor and find the Stories on Money and Value of Money exhibits flanking either side of the lobby. If you’re coming in from Constitution Avenue, you’re already on the first floor and just need to head left for the Stories on Money display or right for the Value of Money exhibit. While I observed many people walking streaming through the Stories on Money exhibit in less than 5 minutes, I spent at least 45 minutes really absorbing everything I saw there. The Value of Money exhibit in the West Wing has more materials, content, and ground to cover. Walking into the Value of Money display is itself impressive… the entry to the exhibit is fashioned as a huge, 1.5-ton vault door! Once inside, you’re greeted by case after case of rare coins and paper money. The coins inside the Value of Money span some 3,000 years and includes virtually every major rarity you’ve ever heard of — and some you probably haven’t. What was the most impressive piece in the Value of Money exhibit? I was tied between 2 features — the 1933 Saint-Gaudens $20 gold double eagle and 1804 Draped Bust silver dollars. Both the Draped Bust dollar and Saint-Gaudens $20 gold double eagle reign among my very favorite coins ever made. The 1933 Saint-Gaudens gold double eagle — a coin that is essentially illegal to own save for the case of a single special circumstance — is worth an estimated $7.5 to $10 million and is in plain sight, just centimeters from your eyes. The 1804 dollar? Well, that’s a little trickier to find. 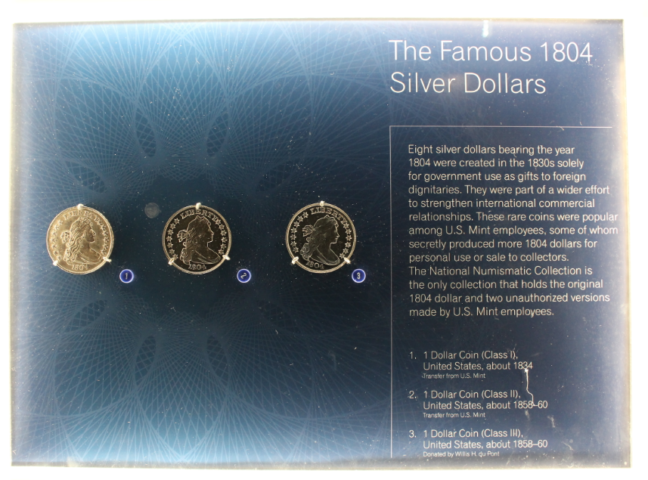 All 3 types of Draped Bust silver dollars were tucked away within one of more than 30 discovery drawers placed throughout the exhibit for you to pull open to see the valuable contents within. The drawer with the 1804 dollars contained a trio of rare and valuable coins worth something close to $30 million! I guess they don’t call the 1804 dollar “The King of American Coins” for nothing. 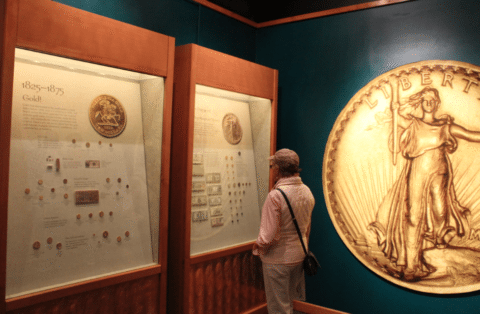 Checking out the rare coins at the Smithsonian Museum is totally FREE from the standpoint of admission — there is neither a charge to enter the museum nor to see the coin exhibits. But parking anywhere near the Smithsonian Museum can be a bit challenging — especially during weekends and anytime during the prime tourist season in spring and summer. I usually park my car along one of the streets along the National Mall. Most of these parking areas are free, but they can be hard to find — especially if you want to be anywhere near your destination. FAQ – Finding A Place To Park In Washington, D.C. Tips For Parking In Washington, D.C. Advice On Parking In Washington, D.C.
My best advice based on personal experience? If you have a hard time finding a parking space in the National Mall, be patient. A spot will open up! Arrive at least a 30 minutes earlier than you intend to be at the Smithsonian — to allow time for finding a spot and walking to the museum. I can pretty much guarantee this: if you’re a diehard numismatist, seeing the rare coins at the Smithsonian will be worth pretty much any parking hassles you may encounter! How Much Are The Gold Coins At The Smithsonian Worth?